There is some amazing news coming from University of Central Florida this winter. A researcher employed there has just discovered a way to use the process of photosynthesis to convert carbon dioxide into clean air and produce a new form of energy in the process. 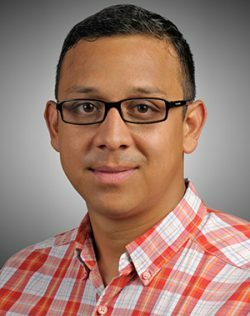 Dr. Fernando Uribe-Romo, assistant professor of chemistry at the Orlando based school has just published his findings in the Journal of Materials Chemistry A. The science community views the process as a potential new technology that may significantly reduce greenhouse gases linked to climate change and offer a clean source of energy as a bonus. Uribe-Romo’s work appears to be offering the world a possible way out of the global warming dilemma just as researchers are warming of looming extinction. Uribe-Romo and his team of students have created a way of triggering a chemical reaction in metal-organic frameworks, a synthetic material, that breaks down carbon dioxide into harmless organic materials. They say it is an artificial process of photosynthesis similar to the way plants convert CO2 and sunlight into food. But instead of plant food, Urbe-Romio’s discovery produces solar fuel. While the process works in the laboratory, Uribe-Romo said the next task will be to “fine-tune” it so synthetic photosynthesis can be used on a larger scale and possibly be a boon to humanity. He describes the process as “tailoring materials that will absorb a specific color of light” to make the process work. He said that from a scientific point of view the process is extremely difficult. Thus the achievement is regarded as an important break-through in developing a technology that may help reduce greenhouse gases. The team is now testing other wavelengths of visible light to see if they also will cause changes in synthetic materials. If successful, Uribe-Romo perceives a day when special energy stations can be established to recycle greenhouse gases while producing clean energy to run electric power plants. The process may also be refined to a point where people can buy rooftop shingles that heat the home while cleaning the air in the neighborhood. Imagine that if enough people buy into this process, the day might come when carbon dioxide will become a premium commodity. So who is Dr. Fernando Uribe-Romo? Born and raised in Ensenada, on the Baja Peninsula, Uribe-Romo did his undergraduate studies at Monterrey Tech. and was an international exchange student at University of Michigan in Ann Arbor. Later he received his doctorate in inorganic chemistry at University of California, Los Angeles. He was a visiting scholar at Newcastle University in the UK and later did postdoctoral work at Cornell University before coming to Central Florida University in 2013. By the way - our president thinks this amazing researcher is a product of a "shithole country."